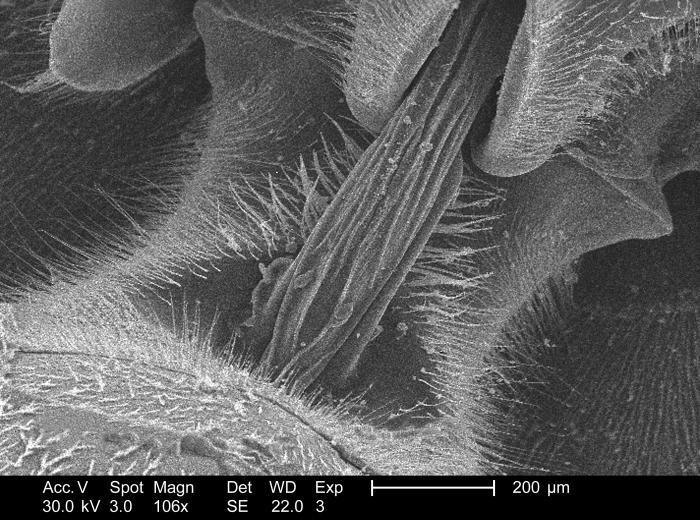 Magnified 106x, this 2005 scanning electron micrograph (SEM) depicted the morphologic characteristics associated with the 'cervix' of an unidentified deceased wasp found on the ground in the Decatur, Georgia suburbs. The cervix is for the most part, a membranous intersegmental connection, which serves to connect the head region with the thoracic region. More precisely it connects the occipital region of the head to the prothorax, i.e., most anterior thoracic segment. In the case of this specimen, note that the membranous cervix lies atop, or superior to the firm chitinous 'cervical sclerites', which provide support to the cervix, and an area to which musculature may attach.